The Good Old Days Catch Up? Songs and sketches of the music hall era performed by modern-day performers. Leonard Sachs presents a 1972 edition of the old-time music hall programme from the stage of the City Varieties Theatre, Leeds. With guests Eartha Kitt and Arthur Askey. 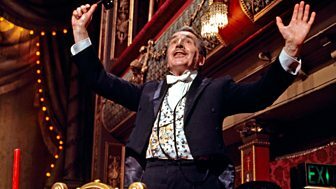 Leonard Sachs presents the old-time music hall programme from the City Varieties Theatre, Leeds. Featuring Beryl Reid, Roy Castle, Lorna Dallas, Gino Donati and the Valla Bertini.